In 1949 Fernand Braudel published his monumental history of the Mediterranean Sea, describing in great detail how the contours of this large and deep body of water shaped the surrounding societies, their cultures, and their conflicts. Braudel’s book reminded readers that despite the powerful claims of monarchs, generals, and lords, geography and climate often have the most enduring effects on social order. Human beings made history near the Mediterranean, according to Braudel, but they made it in ways shaped and constrained by the environment around them. The Mediterranean privileged sea power, trade, and urban communities, according to Braudel. It facilitated empires, but it limited their ability to establish hegemony over wealthy and well-defended islands and coastal cities. The Mediterranean connected Europeans in a single “civilization,” just as it set them against each other in economic and military competition that intensified with modern industrial capabilities. Bill Hayton is no Fernand Braudel. Unlike the esteemed French historian who actually wrote The Mediterranean while confined to a Nazi World War II prison camp, Hayton has spent his career traveling extensively as a reporter for various international news organizations. According to his website, he has worked for Dow Jones TV, CNBC, European Business News, Sky TV, and especially the BBC. His media experience has included long periods of reporting from the Middle East, central and eastern Europe, and Southeast Asia. He published a highly regarded book about contemporary Vietnam in 2010. His new book, The South China Sea, blends his seasoned reportorial eye with an ambitious Braudelian historical vision, producing something one might characterize as a blended historical-journalistic account of Asia’s Mediterranean. Hayton begins with the “prehistory” of the vast waterway that sits between the southeastern lands of the Asian continent and thousands of island chains around present-day Malaysia, Indonesia, and the Philippines. Charting the many travelers who have crossed this sea in multiple directions over time, Hayton clearly explains that “in no sense did any state or people ‘own’ the Sea” (p. 28). The vast and deep waters nurtured rich and fragmented societies around them. The sea facilitated trade, but it limited regional conquest beyond the vast Chinese mainland. Hayton reminds readers that even at their most powerful moments under the Qing, the great Chinese emperors collected tribute from smaller nearby societies, but they never ruled directly in Vietnam or Cambodia or other regional kingdoms. The sea facilitated the projection of the emperor’s wealth and greatness; it limited his ability to rule and dominate, as he did across the Central Asian steppe and other inland areas. The South China Sea is for Hayton a Braudelian civilization, filled with cultures and traditions that are in direct historical dialogue with one another, yet separate and independent. Chinese, Khmer, Vietnamese, Thai, Javanese, and other societies developed through constant contact, frequent blending, and occasional conflict. They shared ideas, markets, and peoples. They recognized cross-sea hierarchies and boundaries, but these were ever-shifting and often quite complex. The Chinese were an acknowledged power around their sea coast, but they did not dominate all activities. The water spaces between present-day Vietnam, Indonesia, and the Philippines had powerful actors with ties on land, but their own seaborne identities challenged landed authority as well. Sea piracy was, in fact, an alternative form of political and social authority, challenging traditional monarchs and trading associations. What makes the South China Sea a civilization is that its very diverse and frequently conflicting constituent parts lived self-consciously together with a somewhat consistent and predictable system of relations. Hayton draws on other scholars to call this the “Mandala” system, in contrast to the Western “Westphalian” system. From the eighteenth century onwards, European statesmen assumed that their authority extended consistently across all areas within their defined political boundaries, and this included overseas empires that often formally belonged, as personal property, to the metropolitan monarch. For the societies around the South China Sea, Hayton describes a system where each political entity had a center, often with a monarch, but that ruler’s power diminished with distance from that center. For many parts of the South China Sea, this meant that areas of frequent trade and travel were distant from all monarchs, but still within the partial authority of many of them. The Mandala system in the South China Sea rejected absolute lines of authority and clear alternatives between ruling figures. Instead, many areas had multiple overlapping rulers, with shared influence over waterways. For the countless small islands that dot the Sea, layerings of association and identity rejected formal sovereignty. The Spratly Islands--between present-day China, Vietnam, and the Philippines--were within the authority of all of these landed areas at the same time. Residents and traders found ways to appease multiple rulers, just as they managed to remain free from complete control by any of them. The South China Sea as a historical and contemporary system of international relations is a canvas with many shades of mixed color (a mandala), not the clear lines with straight edges that Western map-makers have assumed. The discrete territoriality of the post-Westphalian state, with accompanying notions of exclusive sovereignty and citizenship, never shaped the imaginings of actors in the South China Sea. The European state system came to the region through the force of nineteenth-century imperialism, but Hayton shows that it never took hold. The waters were too vast, traditions were too deeply rooted, and Western powers were too limited in their capabilities and knowledge. European influence was, in fact, much stronger on the land than across such a complex and shifting sea. Rather than fixed political power, the South China Sea in Hayton’s account is a space of movement, contingency, and vagueness. No one owns it, but everyone seems to have a piece of it. No one controls it, but many powerful actors shape it. Most important, few live on its waters, but many are close by and travel through it. Like Braudel’s Mediterranean, the South China Sea defines a large and diverse region by the opportunities and limits it simultaneously creates for powerful actors, big and small. Hayton’s book offers its greatest value in bringing this deep history to contemporary conflicts over the sea, its islands, and the surrounding region. Hayton makes a compelling case that the long roster of key actors in current controversies--China, Vietnam, the Philippines, Indonesia, Malaysia, Singapore, Thailand, the United States, and Australia--are plainly wrong when they claim someone has a historical “right” or a legitimate “claim” to control one part of the sea or another. The Chinese, in Hayton’s account, have been most aggressive since the Second World War (both the Guomindang and the People’s Republic) in drawing maps, naming places, and now building artificial islands to assert “inherited” control, where no such inheritance exists. Supplementing his book, Hayton has created a vivid and compelling presentation on his website that details Chinese fabrications and falsehoods about historic rights in the sea. Of course the Chinese are not alone. One of the best parts of Hayton’s book is chapter 3, which begins with an account of the uncertainties and disorganized efforts to re-order the South China Sea in the years after Japan’s defeat in 1945. For a time, no one claimed the Paracel and Spratly Islands. Very quickly, by late 1946, multiple powers claimed them all. This involved ostensible allies, including the Guomindang in China and the new postwar French government. In the years before the outbreak of the Korean War, as the new communist government took power in China, various powers raced to create situations of strength on unoccupied islands, sending small contingents of troops to, quite literally, plant national flags. Despite severe resource constraints, and the limited economic utility of new island claims, the struggling Cold War states around the South China Sea sought to expand their claims in places they never really controlled before. The United States did not initiate any of its own land claims in the immediate region, beyond Guam in the South Pacific, but it acted wherever possible to prevent the expansion of communist influence. This was an early and enduring expression of Washington’s “containment” policy, favoring local anticommunist claims of authority. The United States plays a curious role in Hayton’s book. American military power and economic influence is obviously significant in the twentieth and twenty-first centuries, but Hayton treats the United States as a secondary actor in many cases. American policymakers have consistently sought to keep the waterways open and in friendly hands. The US Navy has often acted as the protector of shipping and the separator of warring parties (especially China and Taiwan after 1950.) Nonetheless, Hayton’s account does not treat the United States as the primary agenda-setter. The inherited system of overlapping regional relations still motivates and constrains relations. The local powers have knowledge and networks of actors on the ground (and at sea) that the United States cannot consistently mobilize. Americans think about the South China Sea as just another region, whereas those in the region treat it as the center of their universe, and the focus of their efforts. In this context, Washington is a reacting and a following, not really a leading actor. The leaders of contemporary China, in Hayton’s account, are trying to exploit their growing size and American distraction to expand Beijing’s control across the region. The recently released Chinese strategic document on maritime power is additional evidence for this almost undeniable observation. Hayton’s book provides the historical context to see how aggressive the Chinese have become, but also to see why they are destined to fail. Just as the United States does not fully understand the complexity of the region, the Chinese leaders are neglecting how this complexity will necessarily limit their power, and probably inspire resistance that diminishes Chinese power overall. Leaders in Beijing are thinking about the South China Sea as an extension of landed authority--that is how they articulate legal claims to “territorial waters.” The value of the sea, and the socioeconomic dynamic that defines its historical development, is movement and trade, not state control. Chinese efforts to assert state control will destroy the value they seek. Local regional actors need not put aside their own differences to combat Chinese aggression; they only need to defend their traditional positions as participants in a complex, multipolar system. The United States is in a very strong position because it does not seek to control the region, but protect the various local actors and the sea-lanes they traverse. This current strategic assessment of the South China Sea returns us to Braudel’s Mediterranean. The French historian wrote about the longue durée of his beloved region, in the shadow of failed German efforts to dominate the land and sea by force. Braudel argued that the vastness, complexity, and historical fragmentation of the Mediterranean made it very difficult for any single ruler, Philip II or Adolf Hitler, to control it. Instead, Braudel anticipated, the relations nurtured by the sea would sink those who reached too far, too fast, with too much force. Geography and history conquered human ambition, not vice versa. Bill Hayton’s book is a useful application of these insights to an area of increasing international conflict. Chinese land claims (and artificial island building) are historically predictable for a growing regional power, as are the severe constraints on Chinese capabilities. A distant power with limited claims, the United States has the opportunity to support the strong historical tendencies toward movement, trade, and local complexity in the South China Sea. This strategy will continue to serve American economic interests, and most of the non-Chinese political actors will continue to support this endeavor. The so-called Asian pivot in American foreign policy is really a reinforcement of historical dynamics, so long as the United States avoids the temptation to assert its own direct control over local events. The regional dynamics align closely with American, not Chinese, aims. Power is often most effective when it is multilateral, cautious, and self-limiting. Too many foreign policy “experts” criticize the United States for showing these qualities in the South China Sea during the last decade. Bill Hayton’s book provides historical and contemporary reasons for embracing these very qualities and conceptualizing them as part of a longer history in a vital world region. Just as the Mediterranean continues to reinforce a diverse and multilayered European social order, the South China Sea is likely to do the same for Asia. The United States can reinforce this stabilizing dynamic if it is prepared to act with this history in mind and play the long game. This is a case where the Chinese, not their neighbors or the Americans, are forgetting the most important lessons from the past. Dr. Jeremi Suri has a joint appointment in the Lyndon B. Johnson School of Public Affairs and the University of Texas at Austin Department of History. Suri was previously with the University of Wisconsin, where he was the E. Gordon Fox Professor of History, the Director of the European Union Center of Excellence, and the Director of the Grand Strategy Program. Suri earned his B.A. in history from Stanford University in 1994 and an M.A. in history from Ohio University in 1996. He then earned his PhD from Yale University in 2001. Professor Suri blogs on foreign policy and contemporary politics at Global Brief. His research interests include the formation and spread of nation-states; the emergence of modern international relations; the connections between foreign policy and domestic politics; the rise of knowledge of institutions as global actors; contemporary foreign policy; international security; protest and dissident movements, and globalization.
. See Fernand Braudel, The Mediterranean and the Mediterranean World in the Age of Philip II, trans. Siân Reynolds, two volumes (Berkeley: University of California Press, 1995, originally published in French in 1949).
. See http://www.billhayton.com (accessed May 27, 2015); Bill Hayton, Vietnam: Rising Dragon (New Haven: Yale University Press, 2010).
. Readers can download this insightful presentation at: https://www.hightail.com/download/UlRTNWNnT00zS3B4Tk1UQw (accessed May 29, 2015).
. See, among many accounts, Keith Johnson, “China’s Military Blueprint: Bigger Navy, Bigger Global Role,” Foreign Policy (May 26, 2015): http://foreignpolicy.com/2015/05/26/chinas-military-blueprint-bigger-navy-bigger-global-role/ (accessed May 29, 2015).
. On this point, see Robert Hutchings and Jeremi Suri, eds., Foreign Policy Breakthroughs: Cases in Successful Diplomacy (New York: Oxford University Press, 2015). Jeremi Suri. 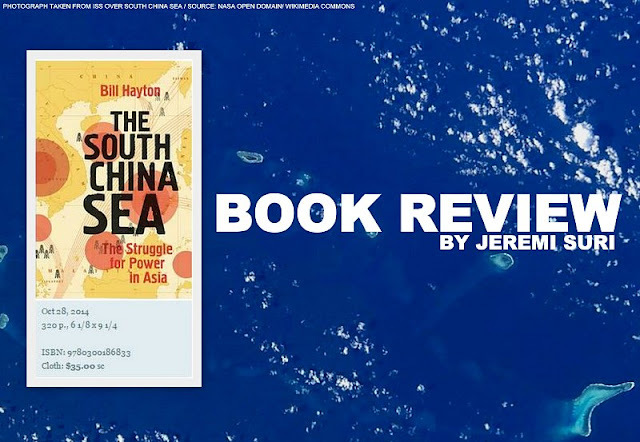 Review of Hayton, Bill, The South China Sea: The Struggle for Power in Asia. H-Asia, H-Net Reviews. June, 2015.